Designed to deliver enhanced 2D and 3D presentations with wide viewing angles similar to white screens of equivalent gain, Precision White Screen technology features edges substantially brighter than a standard silver screen. 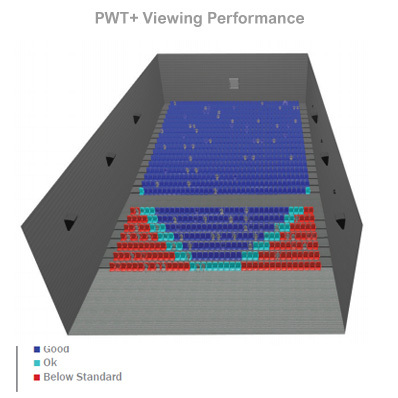 The improved screen efficiency results in 40% more total light coming off the screen, providing more uniform brightness than a standard silver screen. Precision White Screens also feature a smooth, white surface, which generates better image contrast for improved image quality in 2D and 3D. Our proprietary and unique seam welding process ensures our screens have no visible seams under projection conditions. Screens are available in either perforated or non perforated forms depending on speaker placement. Precision White cannot be folded and must be rolled for transportation.